How do I get to the San Francisco Dungeon by Public Transport? How do I get to the San Francisco Dungeon by Ferry? How do I get to the San Francisco Dungeon by Regional Rail Services? 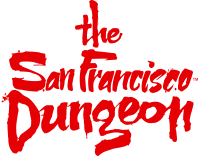 How do I get to the San Francisco Dungeon by Bus? Do you have parking at the San Francisco Dungeon? How close are we to the Dungeons? Sadly, we do not have our own parking garage. However there are several parking lots and garages in the Fisherman’s Wharf area that are just a short walk away from us!